Fuel cells that work with the enzyme hydrogenase are, in principle, just as efficient as those that contain the expensive precious metal platinum as a catalyst. However, the enzymes need an aqueous environment, which makes it difficult for the starting material for the reaction – hydrogen – to reach the enzyme-loaded electrode. Researchers solved this problem by combining previously developed concepts for packaging the enzymes with gas diffusion electrode technology. The system developed in this way achieved significantly higher current densities than previously achieved with hydrogenase fuel cells. In the journal Nature Communications, a team from the Center for Electrochemical Sciences at Ruhr-Universität Bochum, together with colleagues from the Max Planck Institute for Chemical Energy Conversion in Mülheim an der Ruhr and the University of Lisbon, describes how they developed and tested the electrodes. The article was published on 9 November 2018. Gas diffusion electrodes can efficiently transport gaseous raw materials for a chemical reaction to the electrode surface with the catalyst. They have already been tested in various systems, but the catalyst was electrically wired directly to the electrode surface. "In this type of system, only a single layer of enzyme can be applied to the electrode, which limits the flow of current," says Bochum chemist Dr. Adrian Ruff, describing a disadvantage. In addition, the enzymes were not protected from harmful environmental influences. In the case of hydrogenase, however, this is necessary because it is unstable in the presence of oxygen. 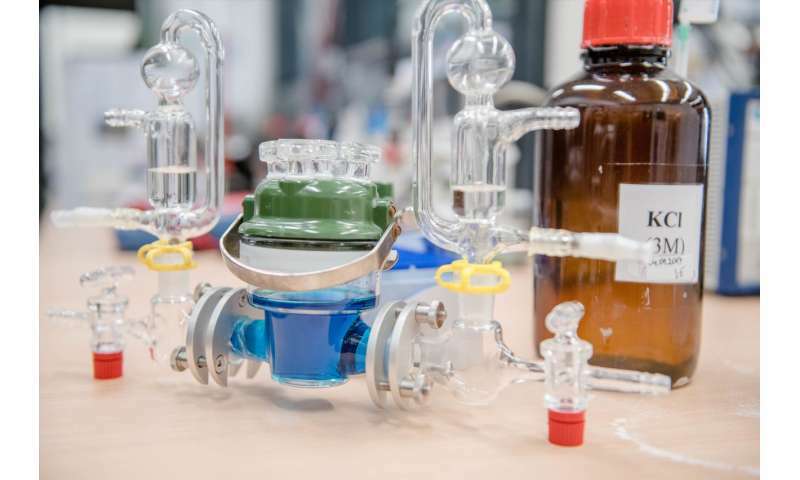 In recent years, the chemists from the Center for Electrochemical Sciences in Bochum have developed a redox polymer in which they can embed hydrogenases and protect them from oxygen. Previously, however, they had only tested this polymer matrix on flat electrodes, not on porous three-dimensional structures such as those employed in gas diffusion electrodes. 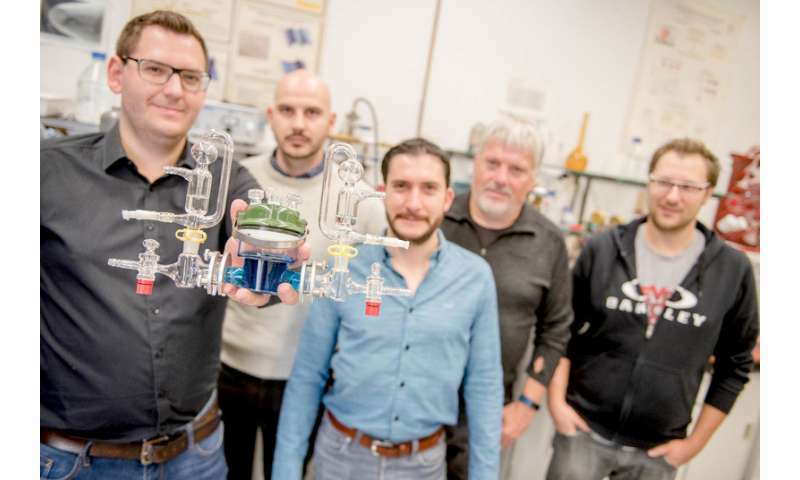 "The porous structures offer a large surface area and thus enable a high enzyme load," says Professor Wolfgang Schuhmann, Head of the Center for Electrochemical Sciences. "But it was not clear whether the oxygen protection shield on these structures would work and whether the system would then still be gas-permeable." One of the problems with the manufacturing process is that the electrodes are hydrophobic, i.e. water-repellent, while the enzymes are hydrophilic, i.e. water-friendly. The two surfaces therefore tend to repel each other. For this reason, the researchers first applied an adhesive yet electron transferring layer to the electrode surface, onto which they then applied the polymer matrix with the enzyme in a second step. "We specifically synthesised a polymer matrix with an optimal balance of hydrophilic and hydrophobic properties," explains Adrian Ruff. "This was the only way to achieve stable films with good catalyst loading." The electrodes constructed in this way were still permeable to gas. The tests also showed that the polymer matrix also functions as an oxygen shield for porous three-dimensional electrodes. The scientists used the system to achieve a current density of eight milliamperes per square centimetre. Earlier bioanodes with polymer and hydrogenase only reached one milliampere per square centimetre. The team combined the bioanode described above with a biocathode and showed that a functional fuel cell can be produced in this way. It achieved a power density of up to 3.6 milliwatts per square centimetre and an open circuit voltage of 1.13 volts, which is just below the theoretical maximum of 1.23 volts.